KIVETAI Mosquito Repellent Bracelets are infused with all natural herbal essential oil formula: Citronella oil (an extremely effective natural insect repellent), Geraniol oils, Lavender oil, Eucalyptus oil and Lemongrass oil, Deet free and non toxic, which can keep the mosquito and bugs away all day and night , offering you and your family a needed protection from mosquito without the harmful ingredients. 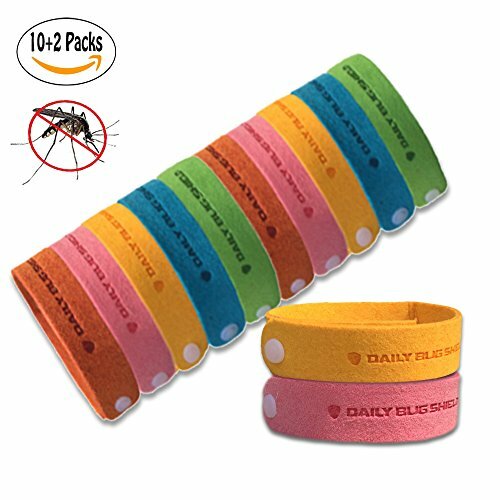 This Mosquito Repellent Wristbands is made of super soft microfiber with 6 separate holes, the length is 9.5 inches, which is more longer and thicker than other wristbands in the market. It can be adjusted to fit on both kids and adults wrist perfectly. This high quality microfiber wristbands are soft and delicate, fresh and breathable, it is kind fashion when you wearing on the wrist and offering protection from Pesky Insects at the same time. Each of KIVETAI Bug Repellent Bracelet is individually wrapped in a sealed bag, which can keep it fresh and preserving effectiveness when not in use. One bracelet provides effective protection up to 72 continuous hours from the moment you open the bag, and all 12 packs can provide more than 720 hours of protection against mosquito bites. This Insect repellent works perfectly for home, office, and especially for outdoor activities, such as hiking, BBQ, gardening, fishing and traveling,etc. It is an essential item for summer, which can intimate care you and your family anytime and anywhere without mosquito bites in this summer. It is kind suitable for babies, pregnant and sensitive people. Outdoor Activities should be fun and enjoyable, Use KIVETAI Mosquito Repellent Bracelets instead of spray to keep annoying mosquito or bugs away will be your best choice, To feel the nature without worry. 100% full refund provided for any unsatisfied reason within 30 days. What are you waiting for? Action now and add it to your cart!